Download "EXPENSE & TRAVEL REIMBURSEMENT"
1 EPENSE & TRAVEL REIMBURSEMENT 1. POLICY PROVISIONS 1.1. This policy and procedure statement covers all approved business-related expenditures incurred by employees of Cooper Consulting Company, hereinafter referred to as Cooper Consulting Company, Cooper, or the Company These policies and procedures are not a guarantee of any kind and are subject to change with or without notice by Cooper Consulting Company These policies and procedures are not in conflict with Cooper Consulting Company s At-Will employment relationship with all employees, and at all times, Cooper will maintain its practice of equal employment opportunity Any expenses incurred that violate the guidelines set forth herein will not be reimbursed. 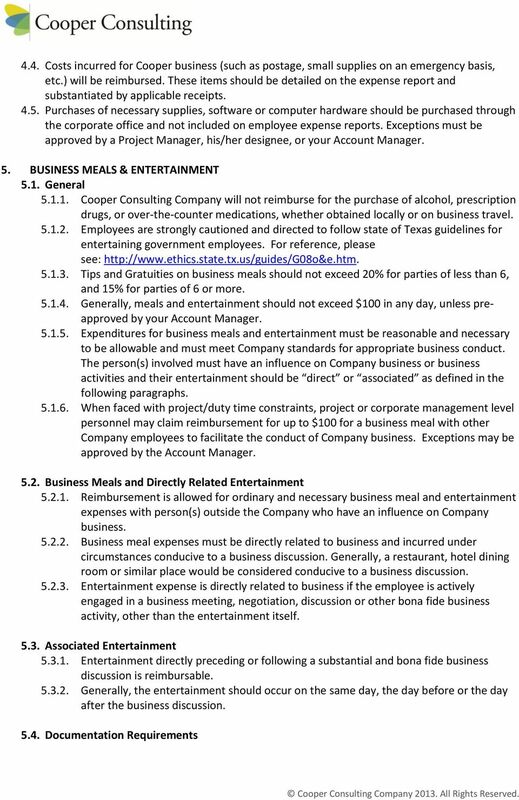 Exceptions will be made in writing by the President of the company Additionally, any expense violating these guidelines should not be approved by a Project Manager, or his/her designee without written approval from the President of the company or her designee Generally, to be reimbursed for business expenses at Cooper Consulting Company, written approval should be obtained from your Project Manager or your Account Manager prior to incurring the expense. 2. EPENSE THRESHOLDS 2.1. Expenses in excess of $50.00 must be pre-approved at the project level by a Project Manager, or his/her designee, employed by the company Expenses in excess of $ must always be pre-approved by the Account Manager or his/her designee. 3. PERSONAL COMMUNICATION DEVICES 3.1. Cooper Consulting Company does not provide, nor reimburse employees for the hardware or the everyday use of cell phones, PDA s, or other mobile, personal communication devices Employees who travel or incur significant business-related expenses for the Company, over and above the regular cost of their own subscription rates for such devices, may request a reimbursement The full statement or invoice must be provided as receipt for such expenses, including actual employee cost for all services and the complete call or log detail for the period of expense. 4. 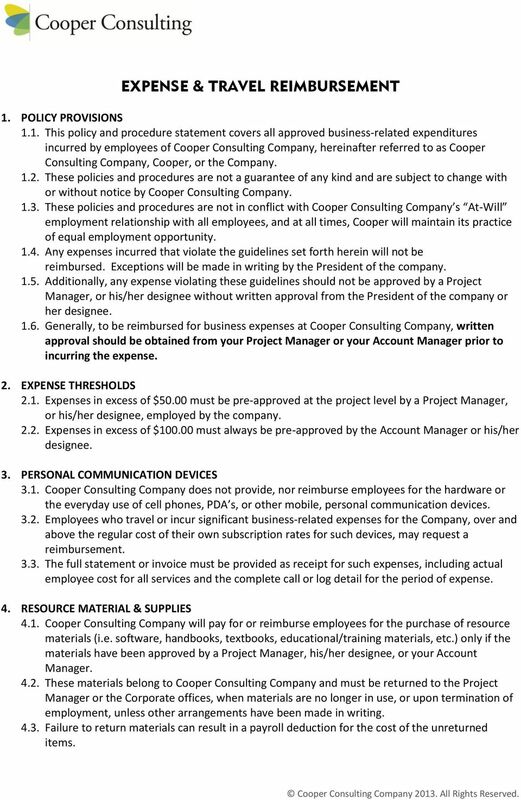 RESOURCE MATERIAL & SUPPLIES 4.1. Cooper Consulting Company will pay for or reimburse employees for the purchase of resource materials (i.e. software, handbooks, textbooks, educational/training materials, etc.) only if the materials have been approved by a Project Manager, his/her designee, or your Account Manager These materials belong to Cooper Consulting Company and must be returned to the Project Manager or the Corporate offices, when materials are no longer in use, or upon termination of employment, unless other arrangements have been made in writing Failure to return materials can result in a payroll deduction for the cost of the unreturned items. 5 ARE THESE EPENSES REIMBURSABLE? Expense Type Yes No Airline tickets purchased in advance submitted for reimbursement prior to travel Personal travel attached to business travel Purchase of upgradeable coach fares, when others are available Upgrades of coach fares Unused airline tickets Air Travel Insurance Airport Parking (long term parking)~$6.00 per day Airport Parking (in short term lots) Business Class Air Travel Coach Class Air Travel In-flight alcohol/ movies Lost Baggage Insurance 14. 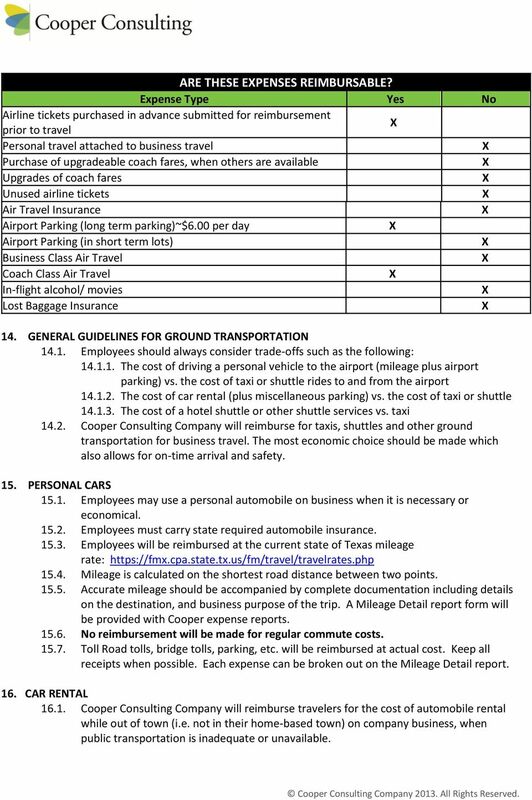 GENERAL GUIDELINES FOR GROUND TRANSPORTATION Employees should always consider trade-offs such as the following: The cost of driving a personal vehicle to the airport (mileage plus airport parking) vs. the cost of taxi or shuttle rides to and from the airport The cost of car rental (plus miscellaneous parking) vs. the cost of taxi or shuttle The cost of a hotel shuttle or other shuttle services vs. taxi Cooper Consulting Company will reimburse for taxis, shuttles and other ground transportation for business travel. The most economic choice should be made which also allows for on-time arrival and safety. 15. PERSONAL CARS Employees may use a personal automobile on business when it is necessary or economical Employees must carry state required automobile insurance Employees will be reimbursed at the current state of Texas mileage rate: Mileage is calculated on the shortest road distance between two points Accurate mileage should be accompanied by complete documentation including details on the destination, and business purpose of the trip. A Mileage Detail report form will be provided with Cooper expense reports No reimbursement will be made for regular commute costs Toll Road tolls, bridge tolls, parking, etc. will be reimbursed at actual cost. Keep all receipts when possible. Each expense can be broken out on the Mileage Detail report. 16. CAR RENTAL Cooper Consulting Company will reimburse travelers for the cost of automobile rental while out of town (i.e. not in their home-based town) on company business, when public transportation is inadequate or unavailable. 6 16.2. If multiple employees are in the same city for the same business purpose, a rental car should be shared by the employees A "compact/economy" size car should be rented, unless the vehicle is to be shared by more than two employees No additional rental car insurance will be reimbursed. If the traveler has an accident, it should be reported to the corporate office as soon as possible The traveler should purchase fuel before returning the car to avoid high re-fueling charges by the rental company. Charges from Rental Car Companies to fill up gas tanks will not be reimbursed. 17. LODGING Business-related lodging expenses including room charges, taxes and gratuities of up to 15% are reimbursable Employees should reserve single rooms at mid-range hotels, which provide adequate access to training and/or client events. 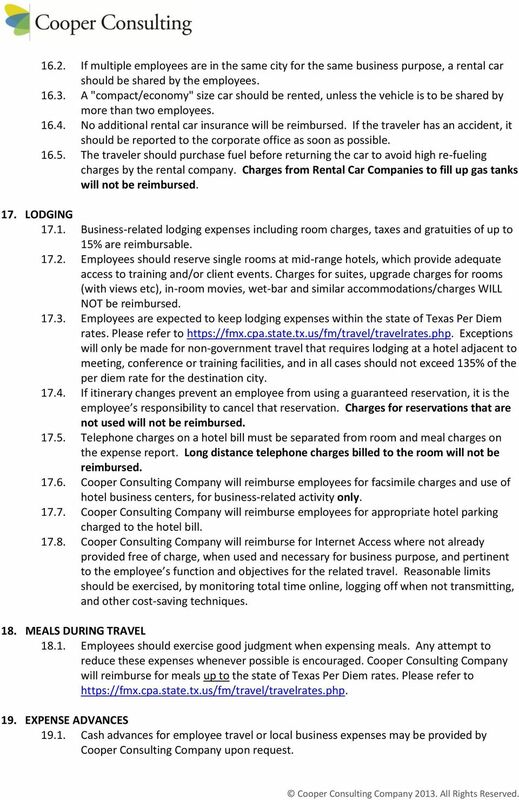 Charges for suites, upgrade charges for rooms (with views etc), in-room movies, wet-bar and similar accommodations/charges WILL NOT be reimbursed Employees are expected to keep lodging expenses within the state of Texas Per Diem rates. Please refer to Exceptions will only be made for non-government travel that requires lodging at a hotel adjacent to meeting, conference or training facilities, and in all cases should not exceed 135% of the per diem rate for the destination city If itinerary changes prevent an employee from using a guaranteed reservation, it is the employee s responsibility to cancel that reservation. Charges for reservations that are not used will not be reimbursed Telephone charges on a hotel bill must be separated from room and meal charges on the expense report. Long distance telephone charges billed to the room will not be reimbursed Cooper Consulting Company will reimburse employees for facsimile charges and use of hotel business centers, for business-related activity only Cooper Consulting Company will reimburse employees for appropriate hotel parking charged to the hotel bill Cooper Consulting Company will reimburse for Internet Access where not already provided free of charge, when used and necessary for business purpose, and pertinent to the employee s function and objectives for the related travel. Reasonable limits should be exercised, by monitoring total time online, logging off when not transmitting, and other cost-saving techniques. 18. MEALS DURING TRAVEL Employees should exercise good judgment when expensing meals. Any attempt to reduce these expenses whenever possible is encouraged. 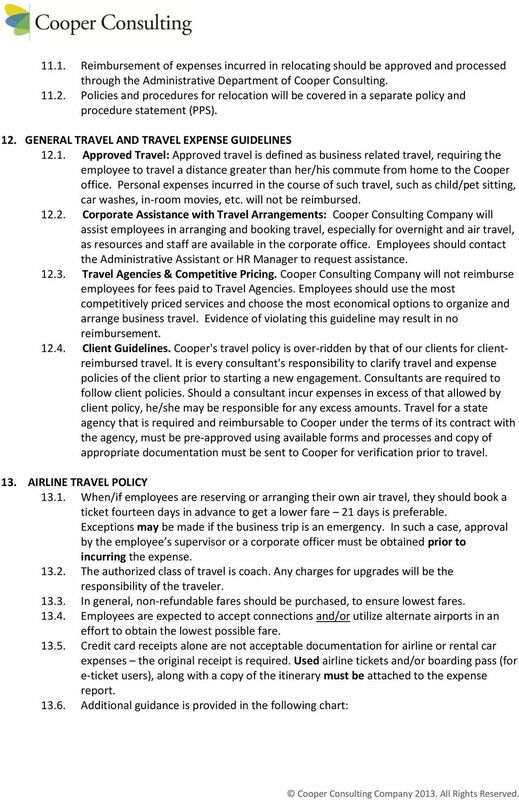 Cooper Consulting Company will reimburse for meals up to the state of Texas Per Diem rates. Please refer to EPENSE ADVANCES Cash advances for employee travel or local business expenses may be provided by Cooper Consulting Company upon request. 7 19.2. Employees may submit a written request for cash advances for travel with detailed cost estimates. 20. EPENSE REPORTING In order to be reimbursed for any business expense, employees MUST complete a standard Cooper expense reimbursement form and submit it to their Project Manager (PM) or Account Manager (AM) for approval. 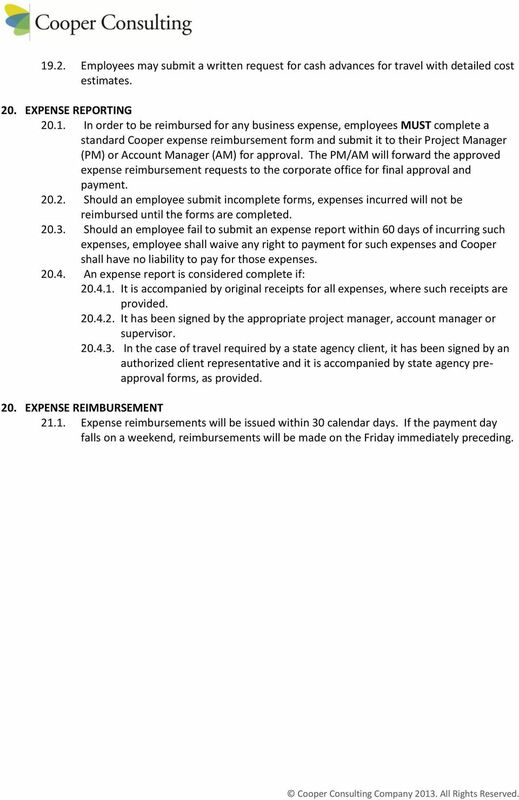 The PM/AM will forward the approved expense reimbursement requests to the corporate office for final approval and payment Should an employee submit incomplete forms, expenses incurred will not be reimbursed until the forms are completed Should an employee fail to submit an expense report within 60 days of incurring such expenses, employee shall waive any right to payment for such expenses and Cooper shall have no liability to pay for those expenses An expense report is considered complete if: It is accompanied by original receipts for all expenses, where such receipts are provided It has been signed by the appropriate project manager, account manager or supervisor In the case of travel required by a state agency client, it has been signed by an authorized client representative and it is accompanied by state agency preapproval forms, as provided. 20. EPENSE REIMBURSEMENT Expense reimbursements will be issued within 30 calendar days. If the payment day falls on a weekend, reimbursements will be made on the Friday immediately preceding. Honorarium A voluntary payment that is given to a person for services for which fees are not legally or traditionally required.